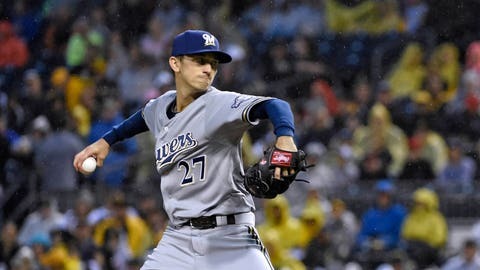 Milwaukee Brewer starter Zach Davies has an ERA of just 2.97 over his last three starts. The Milwaukee Brewers struggled to score against Philadelphia Phillies ace Aaron Nola on Sunday, posting just one run, but they should have an easier time with the Oakland A’s. The Athletics have the league’s worst road ERA since April 23 at a whopping 7.42, following a road sweep at the hands of the Houston Astros. Meanwhile, the Brewers have improved at home over the last month, seeing progress in all areas of their game at Miller Park after a slow start to the season. Catcher Jonathan Lucroy has been among the Brewers’ leaders at the plate, and is set to square off against another hot hand in Oakland veteran Stephen Vogt. The two currently own the longest active hitting streaks by catchers in the league, while Lucroy has upped his batting average to .316 on the season. Lucroy is heating up at the right time, but starting pitcher Zach Davies may be putting together the most impressive turnaround of the Brewers’ season. After struggling to an 0-3 record and a dismal 8.78 ERA through his first three starts Davies has turned things around in recent weeks, logging a 2.97 ERA through his last six starts.